On 13 April, more than 80% of voters in Guinea-Bissau went to the polls, hoping to move on from the political instability and poverty that have come to characterise their country. The final results were announced by the National Electoral Commission on 23 April, confirming the African Party for the Independence of Guinea and Cape Verde (PAIGC) as the leading political force, with 57 members out of 102 in the National People's Assembly. The Social Renewal Party (SRP) has 41 representatives, the Democratic Convergence Party two and the New Democratic Party and the Union for Democratic Change each have one representative. There will be a presidential run-off vote on Sunday, 18 May. José Mário Vaz of the PAIGC, who received 41% of the votes in the first round, will compete with Nuno Gomes Nabiam, who won 25% of votes. Nabiam is an independent candidate supported by the late former president Kumba Yalá and the Army Chief of Staff, General António Injai. These results do not bode well for real political change in the country. The seeds of instability that were present two years ago are still there, and one wonders if these elections could truly meet the expectations of the citizens who want peace, security and stability. The battle for power and the management of the resources between civilian and military authorities remains a huge concern. This has been an ongoing cause of instability and fragility during the transition period, despite the emergence of new political figures. After the military coup in April 2012, the army remained on the political scene and took advantage of weaknesses in transitional institutions to consolidate its position of power. Beyond restoring constitutional order, the main challenge of these elections is thus for new leadership to end the political tensions between civilian and military authorities, and to curb the military’s interference in politics. However, the support for Nabiam by the Army Chief of Staff is reminiscent of the April 2012 coup. Nabiam has won the favour of many supporters of the SRP, at the expense of the party's own candidate, Abel Lamedi Incada, who had received only 7,03% of the votes. On 18 May, Nabiam will face Vaz, who seems to have benefited from the ongoing frustration of civil servants who have been striking due to arrears in wages. Vaz is nicknamed ‘Homi di 25’ (meaning ‘the man of the 25th’ in Creole), since during his tenure as minister of finance, salaries were always paid by the 25th of the month. Indeed, he has benefited greatly from the image of a good manager that he acquired during his time in the finance department, and as the mayor of the capital, Bissau. These two figures emerged during the post-coup transition, which brought about a renewal of the political class. This, along with the removal of the main protagonists of the 2012 elections, gave many citizens hope that change was imminent. Since its independence, presidents in Guinea-Bissau have always hailed from the two largest parties, the PAIGC and SRP, and always in collusion with the army. However, even if new characters have emerged, the election results seem to indicate that this pattern will continue. Indeed, the 18 May run-off elections will see the squaring off of a candidate from the PAIGC and ‘the candidate of the army:’ the two traditional players. Whatever the outcome of the run-off, the two main actors, plus the Nabiam-supporting SRP, will remain at the centre stage of the political system. If Vaz wins, the PAIGC – which already has a majority in the National People’s Assembly – will have full control of the two main bodies. In this scenario, the PAIGC would have to face the army, whose prominent members may fear lawsuits and reforms that could undermine its interests. The army could therefore meddle in political affairs and disrupt government action. If Nabiam were to win, he would have to work with the PAIGC, which has a majority of representatives in the National People’s Assembly. The semi-presidential system in Guinea-Bissau – which involves the sharing of executive power between the prime minister, appointed by the parliamentary majority, and the president – has led to rivalries even when the two hailed from the same party. This could continue to be a problem, especially if the two actors are from opposing political parties. The ‘vicious trio’ of the army, prime minister and president is likely to remain a source of instability if reforms are not initiated and carried out effectively. The resurgence of a political crisis and the possibility of a new coup, as mentioned in the most recent edition of the Institute for Security Studies’ ECOWAS Peace and Security Report, cannot be completely ruled out. True change in Guinea-Bissau can only be driven by the reconciliation of political and military actors, and the establishment of a joint framework for permanent dialogue to implement much-needed political, economic and security reforms. The country’s newly elected authorities will therefore have to initiate broad dialogue between all the national stakeholders to define priorities. Additionally, the military should be involved in the reform of the defence and security sector, from conception through to implementation. Though rightly perceived to be part of the problem, the army should also be considered part of the solution. Finally, a peaceful political climate and a real desire for change from the new authorities would be needed before the support of the international community can be effective. Although external actors provided logistical, financial and technical support to facilitate a credible and peaceful electoral process, the situation could be worsened if their favoured candidate doesn’t win the runoff. 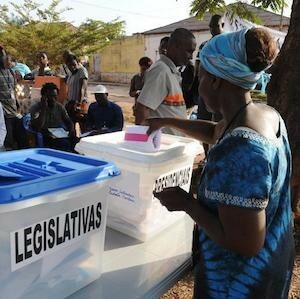 Regardless of the outcome of the 18 May elections, international actors who supported the electoral process must continue in this direction to ensure the implementation of the reforms that Guinea-Bissau so badly needs. Élections générales en Guinée-Bissau: Changement dans la continuité? Plus de 80% d’électeurs bissau-guinéens se sont rendus aux urnes le 13 avril 2014, dans l’espoir de tourner la page de l’instabilité politique et de la pauvreté qui caractérisent ce pays. Les résultats définitifs proclamés par la Commission nationale électorale, le 23 avril 2014, ont confirmé le Parti Africain pour l'indépendance de la Guinée et du Cap-Vert (PAIGC) comme première force politique du pays à l’Assemblée nationale populaire (ANP) avec 57 députés sur 102, devant le Parti de la Rénovation Social (PRS) 41, le Parti de la convergence démocratique deux, tandis que le Parti de la nouvelle démocratie et l’Union pour le changement chacun un député. Ceux des présidentielles par contre, renvoient à un second tour devant opposer le 18 mai 2014, José Mário Vaz candidat du PAIGC crédité de 41% et Nuno Gomes Nabiam de 25%. Il faut rappeler que ce dernier est un candidat indépendant soutenu par feu l’ancien président Kumba Yalá et le chef d’état-major de l’armée, le Général António Injai. A l’analyse, ces résultats ne présagent pas un réel changement dans le paysage politique du pays et remettent à l’ordre du jour les mêmes risques d’une instabilité politique. A l’approche du second tour, on se demande si ces dernières élections combleront véritablement les attentes des citoyens qui aspirent à un peu plus de paix, de sécurité et de stabilité. En effet, l’une des préoccupations majeures dans ce pays demeure les crises politiques qui résultent des luttes entre les sphères civile et militaire pour le contrôle du pouvoir et des ressources. Cette situation a continué même durant la transition qui a pourtant provoqué l'émergence de nouveaux acteurs sur la scène politique. Auteur du coup de force d’avril 2012, l’armée est restée présente sur la scène politique et aurait ainsi profité de la faiblesse des institutions de transition pour consolider sa place au cœur du système de gouvernance. L’enjeu de ces élections demeure donc, au delà du retour à l’ordre constitutionnel, de mettre fin aux tensions politiques et aux immixtions récurrentes de l’armée dans la vie politique. Mais le soutien apporté par le chef d’état-major des armées, António Injai à Nuno Gomes Nabiam, a ravivé les souvenirs du coup de force militaire d’avril 2012. Arrivé deuxième à l’issu du premier tour des présidentielles, ce dernier a engrangé une bonne partie de l’électorat du PRS majoritairement Balante, au détriment du candidat de ce parti, Abel Lamedi Incada crédité de 7.03% des voix. Il fera face au second tour, au candidat du PAIGC José Mário Vaz qui, en plus de la popularité de son parti, semble avoir bénéficié de la détérioration de la situation socio-économique et des grèves récurrentes des fonctionnaires dues à des arriérés de paiement de salaires (entre 3 et 5 mois selon les secteurs). Surnommé “Homi di 25” (l’homme du 25 du mois en créole), car ayant eu l’habitude de payer les salaires le 25 du mois lorsqu’il était ministre des finances, José Mário Vaz a en effet largement bénéficié de l’image d’un bon gestionnaire, acquise lors de son passage à ce ministère et à la mairie de Bissau. Ces deux nouvelles personnalités ont émergé à la faveur de la transition installée suite au coup de force de 2012 et qui a provoqué un renouvellement de la classe politique. Ce qui poussait bon nombre d’électeurs, en l’absence des principaux protagonistes des élections de 2012, a fonder l’espoir sur un possible changement dans ce pays lusophone dirigé, depuis son indépendance, par les deux plus grands partis que sont le PAIGC et le PRS, chacun exploitant ses relations avec l’armée. Toutefois, mêmes si de nouveaux personnages ont émergé, les résultats des élections semblent remettre en place, les mêmes acteurs qui ont jusque là gouverné ce pays. En effet, le second tour du scrutin présidentiel, prévu le 18 mai 2014, opposera le candidat du PAIGC et “le candidat de l’armée”, deux acteurs traditionnels qui constituent la colonne vertébrale des régimes qui se sont succédés en Guinée-Bissau. Ainsi, quelque soit l’issu du second tour, ces deux principaux acteurs, en plus du PRS soutenant Nuno Gomes Nabiam, resteront au cœur du système. Si José Mário Vaz, remporte le second tour, le PAIGC déjà majoritaire à l’ANP, disposera de la plénitude des pouvoirs malgré la minorité de blocage dont disposent les autres partis. Dans cette hypothèse, il aura en face de lui l’armée qui, craignant des poursuites judiciaires et les réformes qui remettent en cause ses intérêts, risque de s’immiscer à nouveau dans la vie politique et de perturber l’action gouvernementale. Si c’est Nuno Gomes Nabiam qui l’emporte, il y’aura une cohabitation à cause de la majorité parlementaire du PAIGC. Le système semi-présidentiel en vigueur à Bissau, qui implique un partage du pouvoir entre le Premier ministre nommé par la majorité parlementaire et le Président, a souvent engendré des rivalités même lorsque les deux occupants sont issus du même parti. Cette situation pourrait continuer à poser problème surtout si les deux protagonistes sont issus de formations politiques opposées. Le cercle vicieux défini par l’armée, la primature et la présidence dont l’impact a été désastreux pour le pays, risque donc de demeurer une source d’instabilité si des reformes ne sont pas initiées et effectivement réalisées. Ceci étant, la résurgence d’une crise politique et l’éventualité d’un nouveau coup d’état, tel que évoqué dans le rapport sur la paix et la sécurité dans l’espace CEDEAO numéro 8, ne peut être complètement écartée. De plus, le passage en force du candidat soutenu par l’armée au détriment des règles de transparence et de crédibilité du deuxième tour des élections pourrait à son tour bloquer la sortie de crise. Dans cette situation et pour éviter la poursuite de l’instabilité politique en Guinée-Bissau, le changement tant souhaité par le peuple bissau-guinéen ne pourra être impulsé que par ces acteurs, politique et militaire qui doivent se réconcilier et mettre en place un cadre de dialogue permanent pour mettre en œuvre les réformes politique, économique et sécuritaire indispensables. Pour ce faire, il s’agira d’abord pour les futures autorités, d’initier une large concertation avec tous les acteurs nationaux pour définir les priorités du pays. Ensuite, Les forces armées devraient être associées dans le processus de la Réforme du secteur de la défense et de la sécurité, de sa conception à sa mise en œuvre. Ces dernières tout en étant perçues comme une partie du problème, doivent être considérées comme une partie de la solution. Enfin, c’est seulement dans le cadre d’un climat politique apaisé et de la manifestation d’une réelle volonté de changement de la part des nouvelles autorités politiques que l’accompagnement de la communauté internationale pourra être efficace. L’implication de celle-ci pour des élections crédibles et apaisées s’est traduite par un soutien logistique, financier et technique au processus électoral. Son action reste cependant sous-tendue par une lutte d’influence qui risque de saper les efforts entrepris pour sortir la Guinée-Bissau de son cycle d’instabilité. Le soutien supposé ou réel apporté par des acteurs de la communauté internationale à certains candidats, pourrait d’avantage compliquer la donne si leur candidat ne remporte pas le second tour des présidentielles. Après le scrutin du 18 mai, les acteurs internationaux qui ont affiché une unité pour l’organisation des élections devraient donc continuer dans ce sens pour s’assurer de la mise en œuvre effective des réformes dont la Guinée-Bissau a besoin.